Did you know that we have had a large Templar Knight presence in Paisley! Check out this emblem above the old Templar Knight hall, The emblem of a Cross, Anchor and Heart translates into “My love is anchored with God”. A group of Good Templar Knights buildings were inaugurated at Paisley on Monday 21st March 1881. They are Classic in style, are built of local stone, and consist of a main hall, 75ft. by 40ft. and 45ft. high. Seating, inclusive of horse-shoe gallery, 1,000 persons; at the rear are two rooms, each seated for 100 persons, and beneath two smaller halls and several minor rooms. Messrs Rennison and Scott, of Paisley, are the architects, and Mr James Barclay, of Paisley, took the principal contract for building. The was around £7,000. A cinema, the Royal Animated Pictures, was opened in 1910 on the upper floor of the halls. Seating on fixed wooden benches accommodated 612 in the stalls and 330 in the gallery. The licence also allowed another 140 people standing. This cinema, renamed the Glen, was the site of a disaster on 31 December 1929, when 71 children died after a call of “fire” resulted in a panic stampede. The cinema never re-opened following the tragedy, and attempts were made to dispose of the building. 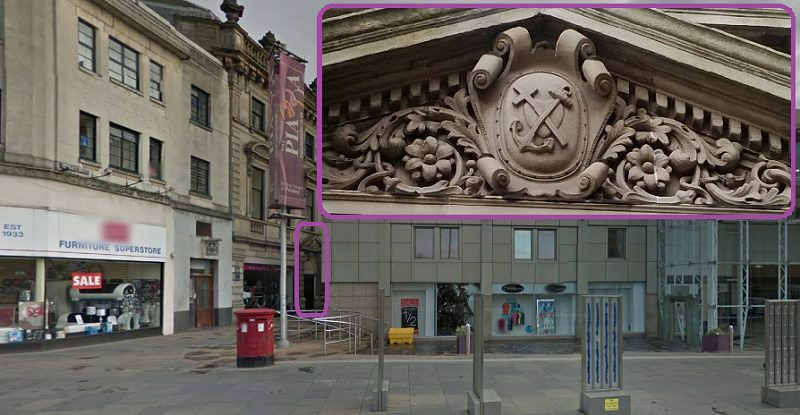 Negotiations were understood to be taking place by the Good Templar Halls Committee and Paisley Town Council with a view to purchase the whole site at the Cross. After the fire the Templars moved the meeting hall to where Mannequins was, then a jazz theatre but where are the Paisley Templar Knights now? Text Courtesy of Paisley Mysteries.